Freedom Rockz: Don't Forget Call Okie Before you Dig! Don't Forget Call Okie Before you Dig! Oklahoma One-Call System, Inc. 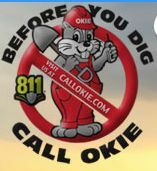 Call Okie is a safety and damage prevention program designed to promote public awareness, provide a communication link between excavators and operators of underground facilities, and to eliminate potential hazards posed to excavators, the general public, vital underground facilities and the environment whenever excavation is done.Call before you dig anywhere in your area to make sure of the location of anything underground that may cause a problem. Click the link below to get further information.